Gulkand aka Rose Marmalade, can't tell you how much I love this, and I had been craving for a sweet sight of this for months that felt like ages. And then, suddenly one day, the 'Prince Charming' on that white Equus caballus/ horse arrives, carrying a silly bottle of Rose Marmalade, and shouting, 'Wake up from sleep, my Rapunzel!'. Haha...I always wanted to be one, not because of being a princess, but just that I loved her pretty gowns and beautiful attires!! Keeping all that Fiona fun apart, I really wanted this 'Gulkand/ Rose Marmalade Jar' desperately and a Romanian friend of mine gifted that to me a month ago. I had to be really grateful to her for that because thinking of this dainty delight was like a dream in Nairobi where it's hard to get refined white sugar even (just because they prefer brown sugar here). I have a big list of experiments to conduct on this niminy-piminy item and this one is the second successful launch ( after the first one with Pistachio Cookies, if you remember!). Take a heavy bottomed wok/kadai and pour milk in it. Bring it to a boil and then simmer. Add the pre-washed and soaked rice to that. Let it cook for around 30 minutes on medium heat till the rice goes tender and mushy. Keep stirring every now and then to make sure that the rice doesn't stick to the bottom. Also, keep on scrapping the cream (malai) that layers on the side walls and mix that with the boiling milk. Once the rice is soft and done, and the milk almost reduced to half, add in the sugar, cardamom powder, almonds and pistachios. Cook for 5 minutes on low flame with occasional stirring. Let it cool and then refrigerate for 2-4 hours. 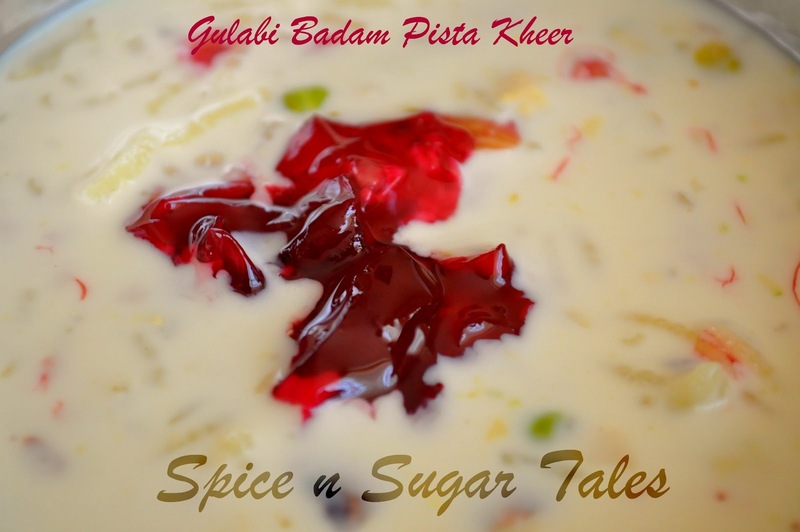 Just before serving, take a spoonful or more of Gulkand/ Rose Marmalade and pour it over the kheer along with some trimmed nuts. Let the gourmet mix it and dive in its aroma and flavors. You can use any variety of rice, but I always prefer Sona Masuri or Basmati. If you are using sticky rice, beware that it doesn't stick and reduce its quantity a little to avoid excess thickening of the kheer. 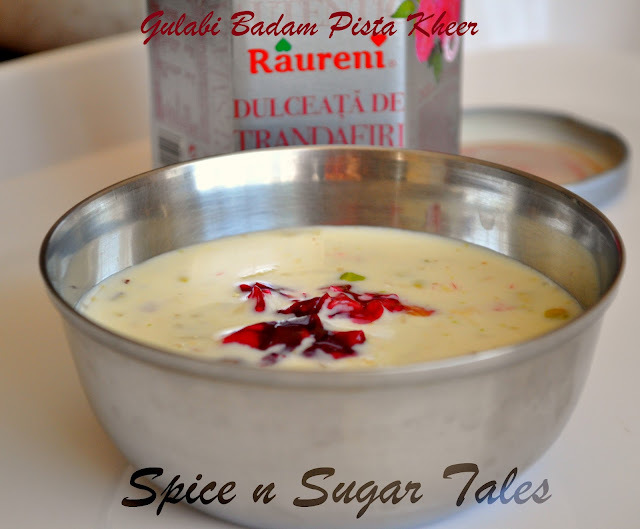 Full Cream Milk is always the best when it comes to making kheer/rabdi/basundi, but you can opt for versions that lie in your comfort zone. Saffron can be added to enhance the flavor, but I prefer not to mix two strongly aromatic constituents together, ie. Rose and Saffron. Alternately, you can also make Kesar Badam Pista Kheer by adding saffron strands during the boil and omitting the Gulkand part. Make sure that the wok/kadai you choose is big enough to avoid any spilling of the milk on boiling. It always tastes better when refrigerated. mmmmmmm..........looks so inviting! !definitely want to try this one! you have A lovely page here anjali! glad to be ur follower! Thanks for linking it ...@ Holi Hai. 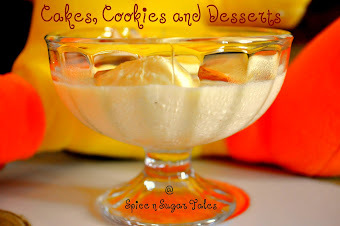 wow...very interesting n delicious looking dessert....great recipe dear...thanks for sending over! I love your translation of the dish in english :D.. anjali this is so tempting..have never been a fan of gulkhand but now ur dish wants me to give it a shot again! gorgeous dessert!i too love the flavour of gulkand. 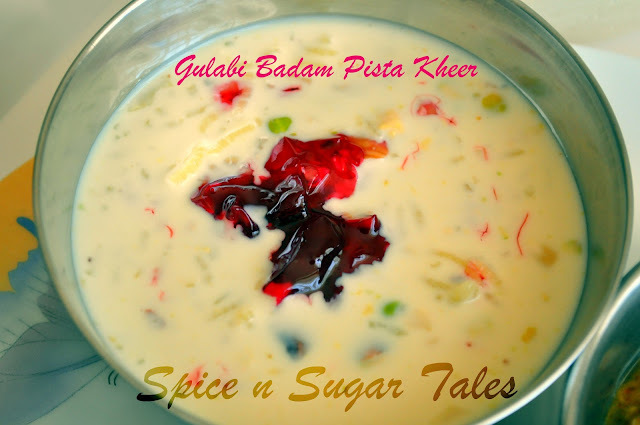 Lovely color and brilliant Kheer !! very appealing too !! Thanks for linking to the event !! So pretty , it looks devine and I am sure tastes perfect. Pudding looks inviting. Yummy flavors. Thx for linking to the event. Wow.. It looks so good.! yummm... thanks for linking up to my event. That looks decadent & delicious - With 1 litre of full cream - here is my game plan for this one - I buy some shot glasses and take a shot a day - for as long as it will last! looks SO delicious!!!!! What a beautiful pudding! Thanks for sending it to Cook.Eat.Delicious-Desserts. SIMPLY DIVINE...!!!! !WIL TRY OUT SOON!! 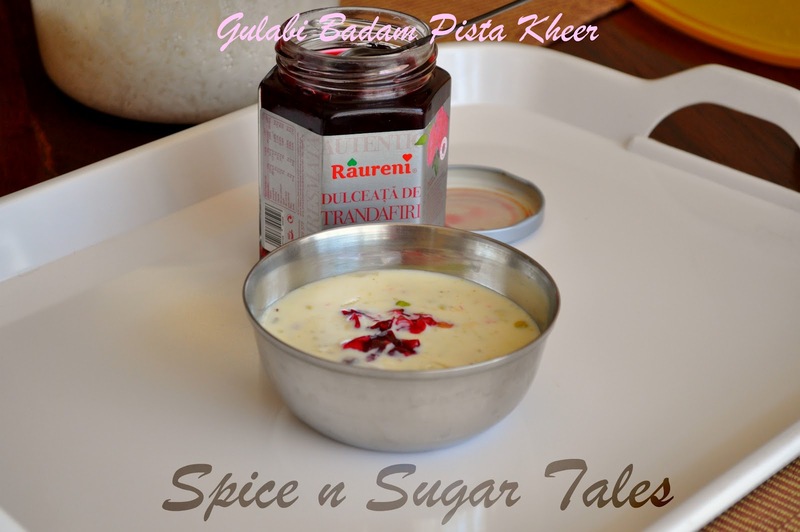 Awesome recipe and excellent clicks.. I am drooling here. Glad to follow you!!! looks superb and awesome clicks..